4HIM has spent more than a decade inspiring and encouraging Christians with their music. Now their ministry contains a newfound urgency to call Christians together. The hands and feet of Jesus must be made visible to change a world seeking stability in the midst of instability. Celebrating its landmark 10th studio album, eight-time Dove Award-winning group 4HIM unveils Visible, a record of inspiring resolution in its message and one of noble empowerment in its capacity to encourage listeners. Visible is an artful illustration of individual courage in the face of cultural relativism and a call for communal triumph won from tragic national loss. 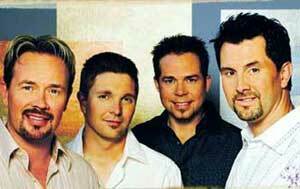 After 13 years together, Andy Chrisman, Kirk Sullivan, Mark Harris and Marty Magehee offer Visible, showing again 4HIM's exceptional success as one of the most beloved groups in Christian music. Visible follows on the heels of two definitive career records: Walk On (2001) and Hymns-A Place of Worship (2000). Continuing the musical momentum of each of those records, Visible fuses adult contemporary pop songs with modern praise & worship music. The stunning result is a record that's relevant to the church's worship and its faithful response of ministry to the world. 4HIM's Mark Harris says, "The songs on Visible are some of the best songs we've recorded," a brazen statement for a group with a proven track record of tapping great songs-including 24 No. 1 singles. "The theme that emerged from the last record was perseverance," says Andy of Walk On. "Visible is the next step past that. We, as a church, have persevered through very difficult times. Now, what are we going to do? Let's get something accomplished for the kingdom of God. We can't let our guard down. Now is the time to act." "We heard people talk a lot about their confusion in the wake of Sept. 11, and then, most recently, their confusion in light of the war with Iraq," explains Marty. "People wanted to talk about what needed to be done to confront evil in the world. In response, we decided to tell people what the truth is. As Christians, we have that truth in Christ, but right now God's truth seems so hard for people to find and accept. These songs are geared toward waking people up, saying, 'No, this is the truth!'" Mark adds, "Visible is a call to action for believers. Our greatest responsibility as Christians is to make the invisible God visible. The world can't see Him, so we have to make Him visible. We make God visible when we worship, when we persevere and when we act." The chorus of the title track proclaims, "This is my only passion, the very reason why I live/To make You known/To make You seen/To be your hands/To be Your feet/I want to be a revelation of love/I want to make the invisible God visible." Classic 4HIM pops from the disc's first spin-tight, signature harmonies and powerful, evocative vocals interpreting contagious inspirational songs that burst with images of hope. On Visible, that's the majesty of creation's beauty, a young child praying, a life lived without fear and the promise of Bethlehem. "Bigger Than Life" finds Kirk's distinctive lead vocal over a rock-solid bed of 4HIM harmonies, reminding listeners ours' is an all-powerful God. Andy delivers an unguarded opening chorus in "The Final Word" before the first verse ushers in an up-tempo pop beat affirming the constancy of God's love. "The Promise" is a wise reminder that God's enduring presence doesn't always take the form of the expected. Arresting, though, is the underlying humility of the title track. "Visible" echoes the powerful stories of biblical heroes unsure of God's calling, but always faithful in their service. As he has done so many times before in his songwriting, Mark Harris deftly marries vulnerability with personal declaration to act boldly for the cause of Christ. Further, Visible weaves a compelling thread of worship music among its pop songs, including the record's robust opening track "Fill the Earth," the rally cry of "It's All About Jesus," "You Reign" and "No Other Reason." The impulse to act for truth and mercy in the world comes from the joy of just such a praise offering. "We've never been a worship artist," says Andy, who, when he's not traveling with the group, serves as the full-time worship pastor at Celebrate Family church in Celebration, Florida. "I think there is a difference between singing evangelistic songs and telling people about the goodness of God, which is what we've done over the last 13 years. Really, we're just starting to add a worship element to the music we do, meaning songs that are sung directly to God as an act of giving and an act of prayer." A cut that holds special meaning to 4HIM is "Candle in the Rain," a song recognizing God as the indispensable source of hope when surrounded by desperate darkness. Initially written by Tony Wood and Mark as a response to Sept. 11, 4HIM dedicates this song to Gracia Burnham, an American missionary who in 2001, along with her husband, Martin, was among several taken hostage in the Philippines. All were held for ransom. Only Mrs. Burnham survived. Later, the members of 4HIM received a letter from Mrs. Burnham's sister thanking them for their music. She shared that their music had been a source of encouragement to Gracia following the ordeal. "That letter spoke to our hearts, letting us know there are people who need to hear songs that allow them to say, 'I can go on,'" says Mark. Musically, the record is built on sturdy acoustic guitar-driven pop songs. "People will hear a lot of wood on this album, meaning there's a lot of warm, very organic musical parts, which is what you get using an array of acoustic instruments," Mark says, citing the aggressive guitar-driven track "Let Your Kingdom Come" as an example. "Then there are live strings built on top of that. Filling it all in are the harmonies-lots of harmonies. There's a ton of group work here, maybe more than the last couple of records." It's a quality consistent with the record's overall message to the church to come together to be true light. The guys credit producers Michael Omartian and Pete Kipley for drawing from them compelling vocal performances on this outing. "We worked with Pete on our WOW Worship track, 'Thy Word,' and we really hit it off," says Andy. And what about working with Michael Omartian? The foursome respond crisply and unabashedly. "Stunning!" says Kirk. "A great privilege," Andy replies. "The musician's musician," concludes Mark. For Visible, Omartian and Kipley gathered outstanding studio talent, including guitarist Chris Rodriquez (who also handled A&R duties), Jerry McPherson (guitars), Mark Hill (bass), Tim Akers (piano), Dan Needham (drums) and Eric Darken (percussion). Rob Mathes arranged strings performed by the Nashville String Machine. And a new helmsman found himself behind the board for this record. Since moving to Nashville, Marty has felt called to develop younger artists pursuing music ministry. Consequently, he's been moonlighting as a producer and a self-described production "grunt." Sitting recently in Mark's truck outside Starbucks in Mobile, Ala., where Mark makes his home, Marty inquired, "Hey, how about giving me a shot at a track?" The group responded in kind. Marty produced the ethereal "No Other Reason," a rich, edgy sidewinder for the group and Marty's first major production credit. While the guys speak fondly of such behind-the-scenes memories of the recording, they quickly return to its real purpose. With Visible, 4HIM candidly issues a challenge to Christians to make the invisible God visible to empty, longing hearts. With strong pop songs and moving praise & worship, the four men have created a soundtrack for doing just that, calling listeners to add form and color, hands and feet. "We hope people hear why they like 4HIM in the first place," says Kirk, adding how grateful the group is for years of fan, radio and retail support. "And more," adds Mark, "we hope this is an album that will encourage people, one that will move them to worship and one that will move them to impact the hearts of their friends with the love of God."